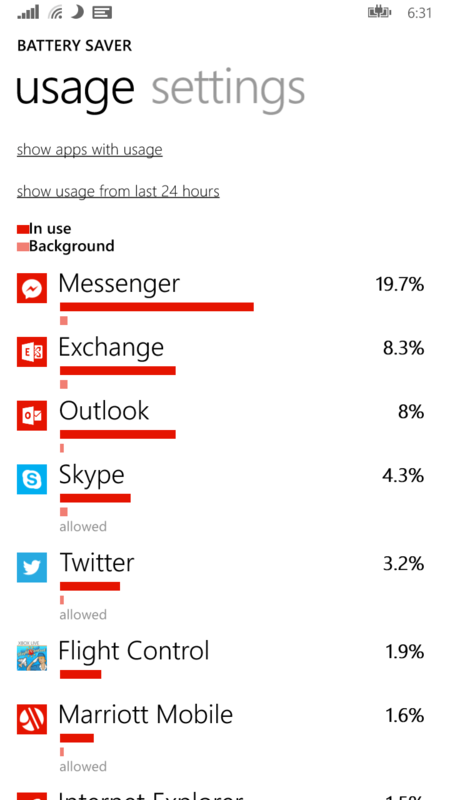 Microsoft has released a big update to the Battery Saver app for Windows Phone. The Battery Saver app allows you to quickly and easily identify those apps which are consuming the most of your battery power, manage them and manage how your Windows Phone performs when it is running low on battery. Frankly I’m not sure why this app isn’t named Battery Sense as it is installed on every new Microsoft Lumia Windows Phone and seems to stick out a bit naming wise from the other Sense apps. The update has a lot of new features and information that can help you see which app is consuming the most of your battery either all time or over the past 24 hours. Perhaps the biggest has been the improved battery usage scale in the Battery Saver app. The usage data now scales to the actual device battery capacity with full width mapping to 100% capacity. What that means is that the 3200mAh hour battery in my Lumia 1320, the usage scale will be far more accurate than before and it will be a different formula for my Lumia 520 with its 1100mAh battery. In other words, it’s more accurate. Battery Saver for Windows Phone – Free – Download NowAnother new feature of this release of the Battery Saver app is the Foreground versus Background scales. Now you can see through two different bars on each app how much power that app has consumed while it was in the foreground of your Windows Phone versus running in the background. as you go throughout your day. This feature does require that you have Windows Phone 8.1.14203 on your Lumia. Here is the interesting part however. 14203 isn’t released yet. The latest Preview build is 14192. My guess is that we see an updated version of Windows Phone very soon. Foreground vs Background metrics: Usage bars now show foreground and background showing you how much power a particular app consumes whether you’re using it or not using it. Time Filters: We’ve added a filter also in the usage view where you can now specify the timeframe of data to look at. Can now show data from the last day, 2 days or a week. What Does Battery saver do anyway? : Re-worded the settings page to more clearly indicate what battery saver mode does. Turn On until next charge: We added a new option to let users turn on battery saver until next charge! Improved Battery usage scaling: The usage data now scales to actual device battery capacity with full width mapping to 100% capacity. Additionally, the bars now use a logarithmic scaling algorithm to make the bars more visible when usage is small for a particular app. The Battery Saver app for Windows Phone is a free app and is available now in the Windows Phone Store on your device or at the link below.